As a college student, Alyssia Kelley knows well how a college education can quickly become a major financial burden. This resourceful go-getter has found her solution to the predicament by scaling the golden arches. McDonald's is well-known for its burgers and fries, but what's not as obvious is how the fast-food giant is helping its workers further their education. Under Archways to Opportunity , restaurant employees can receive tuition assistance to earn their college degree, high school diploma or even sharpen their English language skills. "Because of this program, I always had enough to cover what my scholarship and aid did not cover," Kelley said. "This money allowed me to put a dent into my student debt and pay any overages I may have had." Phil Saken, communications and brand reputation manager for McDonald's, said the company asked employees what would be helpful for them to achieve their life goals. "They told us about their ambitions to finish high school, go on to college to earn a degree, advance their careers and determine their own path for success." Crew workers can receive up to $2,500 per year and managers up to $3,000 per year to go to college. "To be eligible, restaurant employees need to have worked at least 90 days in the restaurant at an average of 15 hours per week," Saken explained. "They also need to be in good standing with their respective owner/operator and receive a passing grade to receive any additional tuition assistance." McDonald's Corporation funds the tuition assistance program to help pay for college courses at any accredited four-year university, community college, trade school or graduate school. 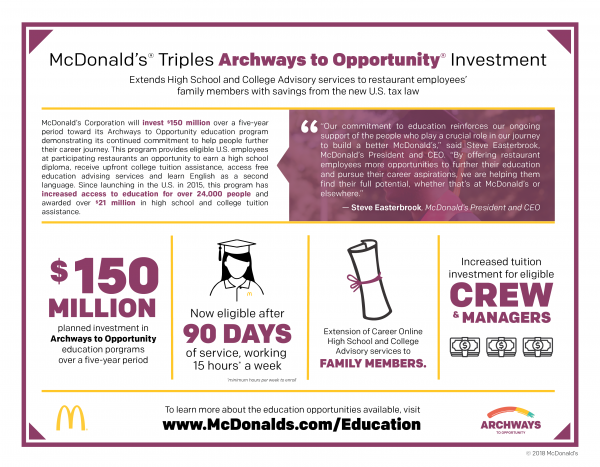 Saken said that earlier this year, McDonald's announced an additional five-year, $150 million investment in Archways to Opportunity, significantly increasing the amount of tuition assistance that employees could receive. Meanwhile, with tuition assistance in hand, Kelley forges ahead with her next goal: A master's degree in social work from Northern Kentucky University. It was the same tuition assistance program that helped her complete her Bachelor of Social Work from Xavier University in May. Now in her seventh year, Kelley has stayed with McDonald's in Maineville since high school because of "their amazing flexibility and benefits." She credits her job flexibility for helping her balance the 32-plus hours she puts in at the restaurant every week in addition to going to school full-time and taking on an internship for the last two years of undergraduate school. "I could close, open, work a mid, and I could leave and come back," she said. "They would work around any class schedule or demands on my time." Another worker, Maria Guadalupe Arroyo Guszman, furthered her education through a different track: English Under the Arches (EUA), a tuition-free program that focuses on English language skills for non-native speakers. She enrolled in EUA in 2016 and finished the program after 22 weeks. "I have better communication with my crew and my customers," Guszman, now an assistant manager, said. "My confidence has grown as well. Being able to communicate is the biggest difference." Guszman said she's found "tremendous opportunity" at McDonald's and is currently working on getting her high school diploma through Arches to Opportunity. "My goal is to one day be a general manager and run my own restaurant," she said. Because of its size and scale, McDonald's restaurants may seem removed from any local connection but for the more than 110 restaurants in the Tristate, quite the opposite is true. "More than 90% of those restaurants are owned and operated by independent businessmen and women who live, work and lead in the communities they serve," Saken said. Katie Blankenship owns and operates four restaurants in Mason, Sycamore Township, Lebanon and Monroe. "I grew up with McDonald's surrounding me because it was our family business, so I always respected McDonald's and the opportunities it offered," she said. Originally from Loveland, Ohio, Blankenship now resides in Symmes Township. Five of Blankenship's employees -- including Kelley -- have applied for tuition assistance this year, and another four -- including Guszman -- have graduated from the EUA. "I have gained some great leaders in my restaurants," she said. "All four of my EUA graduates have remained long-term employees, and they are an assistant manager, two shift managers and a production manager." As Kelley works toward her master's degree, she knows the day will come when she parts ways with McDonald's. Long term, she intends to follow her passion in social work and start a new career in a hospital or nursing home. This is where she's particularly thankful to McDonald's. "Even though they know I'm going to leave…they have never held back on developing me and furthering my skills," she said. "That has opened up so many opportunities for me." Grace Yek writes about food for WCPO Digital. She is a certified chef-de-cuisine with the American Culinary Federation, and a former chemical engineer. Connect with her on graceyek.com .